SUMMARY: High school senior and tomboy Jordan Woods has it all planned. She's the best quarterback in the state, and she hopes to play football at the University of Alabama next year. But Jordan's plans are in jeopardy when gorgeous Ty Green moves to town. Ty not only makes Jordan lose her focus--he's also a star quarterback, and he's starting to get a lot of attention from college recruiters. WHAT I LIKED: Awww...so sweet! 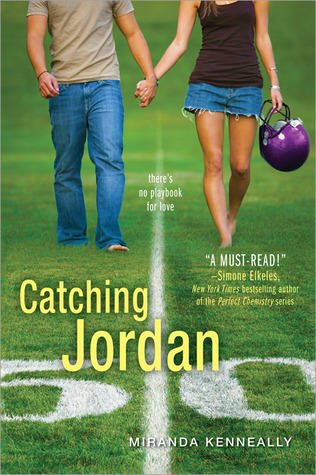 Catching Jordan was the only Hundred Oaks series book I had not read (ironic, since it's the first in the series), and as with Stealing Parker and Things I Can't Forget, I fell in love with Jordan's story as well. If you haven't tried any of the three books in the Hundred Oaks series, I encourage you to give them a whirl. Each book tells the story of a different Hundred Oaks High School student. While romance is central to all three books, the protagonists (all girls) also deal with other life issues--a neglectful father, best friend arguments, what to do after high school, community gossip--in realistic ways. I love that the characters are never perfect and make plenty of mistakes and the fact that the romance doesn't come easily (no insta-love!). WHAT I DIDN'T LIKE: Maybe a bit predictable. Some of this is my own fault for reading the other two books in the series first, but I would have figured out the story anyway. I devoured this book (and the others) in one sitting, so the predictability clearly didn't bother me too much! THE BOTTOM LINE: Every book in this series is sweet, cute, and fun. The engrossing story and engaging plot make Catching Jordan a great choice for high school girls who don't like to read. STATUS IN MY LIBRARY: We have it, but I am moving it to our "high school collection" due to sexual content. Have you read any books in this series? What do you think?